All powder handling and processing within a manufacturing process has the potential for generating dust in the atmosphere of the facility where the powder handling equipment is housed. Minimizing dust levels well below hazardous and explosive levels are important to avoid loss of life, injuries and lost plant, equipment and money. Dust control for powder handling is important. Examples? The CSB (US Chemical Safety Board) published this video after an exhaustive study. The first of three major recommendations made by the CSB is “Control Fugitive Dust Emissions”. Dry material weighing systems, Micro, Minor and Bulk batching systems, and Bulk Bag Unloading systems all have the ability to generate dust within the atmosphere in your facility. While these systems are not the cause of any known dust hazard incidents, it is important to minimize or eliminate their contribution of dust to prevent any hazard, including the hazard of the existence of toxic dust, not just explosive dust. So how do we do this? Two types of feeders are routinely used in material weighing systems, most often the screw or auger feeder is used. However, it is not uncommon to use vibratory feeders. The Sterling Systems ACCU-PORTION™ Micro, Minor and Bulk batching systems and the general industry Material Weighing Systems use the Sterling manufactured screw/auger feeders as standard. For high accuracy systems the vibratory type feeder may be used, especially where the weighment is Micro (under 50lbs/23kg) in size. 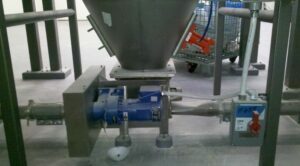 Figure 3: Vibratory feeder shown with sealed cover, dust sock connecting supply bin to feeder inlet and feeder sock connecting feeder discharge to the micro scale hopper. The methods used for Dust control with Screw/Auger feeders depends on the mode of batch collection and takeoff. If the takeoff method is by conveyor, pneumatic or drag, the batches are collected in scale hoppers. Sterling Systems & Controls routinely and uniquely uses multiple scale hoppers to increase throughput, accuracy and customer profitability. Dust control when using screw/auger feeders that discharge into one or more scale hoppers is accomplished by using sealed top hoppers and “feeder socks” (Figure 2). A feeder sock is flexible and secured top (feeder) and bottom (scale hopper) and made of Nylon Satin material. 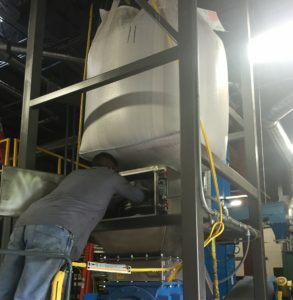 This allows for a flexible connection between the feeder and hopper, and eliminates potential dust during the ingredient batching process. 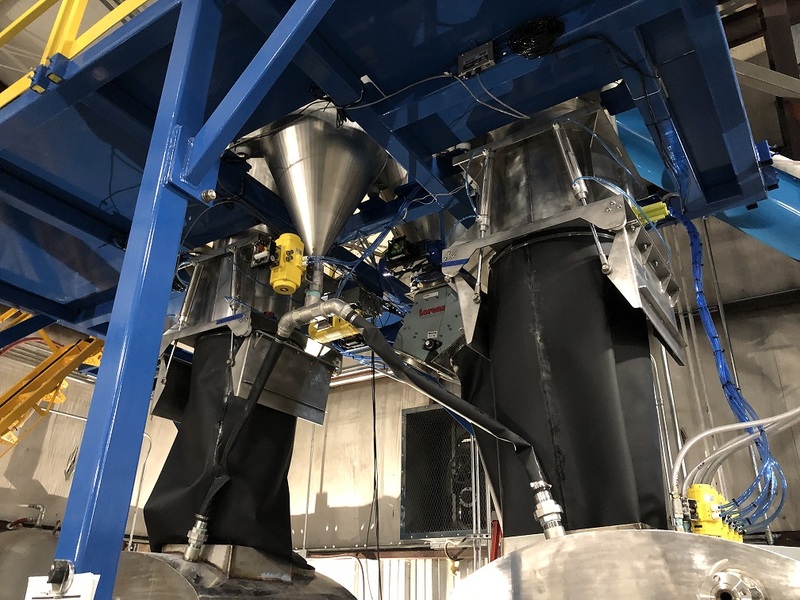 Generally speaking 5 or 6 ingredients will be collected in a single scale hopper (but that can vary and be less or more depending on system performance requirements). The pneumatic and mechanical methods of conveyance from scale hoppers downstream are sealed as well. A typical pneumatic conveying takeoff is shown above (Figure 1). When vibratory feeders are used the feeder tray is provided with a cover and feeder and bin dust socks are also used. The picture above illustrates this (Figure 3). In this installation the vibratory feeders are used to provide very high accuracy of a small micro weighment into a large traveling tote. Dust collection is also utilized in this case because of the traveling tote. The vibratory feeders discharge through a feeder hood that is also a dust collector hood. This brings us to the next item for discussion, Dust Collection. When the material weighing system or micro/minor/bulk batching system collects the batches and weighed material in a traveling tote, a dust collection system is often required, especially if the dust is deemed in any way to be explosive, toxic, or capable of accumulating to fuel any possible secondary explosion. This need can exist with small totes and large totes. The experience and skill of a dust collection system manufacturer is needed to ensure the system is properly sized and engineered to be 100% effective. Proper maintenance is also required to dispose of collected dust and to ensure the system is cleaned and maintained in good working order at all times. An example of a dust collector used with a material weighing system (micro, minor or bulk) is shown to the right (Figure 5). 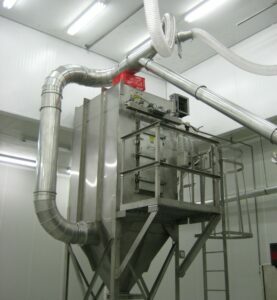 This particular dust collector is used in conjunction with a minor ingredient batching system in a food application. This system collects dust during the ingredient discharge and batch collection process and during supply bin refills. 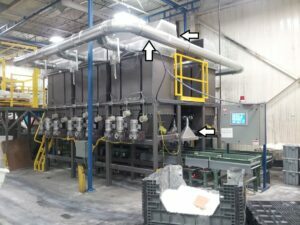 In another photo above (Figure 4) arrows point to dust collection hoods above the supply bins and above traveling totes which collect the batches. When properly designed and maintained these dust collection systems will help eliminate dust control problems. 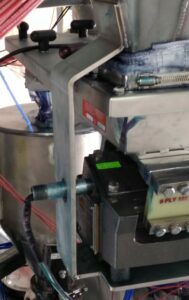 Figure 6: Dust containment enclosure with valve and dust collection works to eliminate dust during bag connection, discharging and disconnection. Man powders are sold and shipped in large bags. They are called “bulk bags“. They are also know by other names, such as FIBC’s (flexible intermediate bulk containers). A piece of process equipment known as a bulk bag unloader or bulk bag discharger is used to remove or unload the powder or bulk material from the bag. When dealing with the removal of powder materials from bulk bags we have to potential for dust to be introduced into the facility atmosphere. Design of the bulk bag unloading system can be such that dust is minimized or eliminated at the discharge point. This is accomplished most often by using a dust containment box and other components such as an iris valve and connection to a dust collection system. 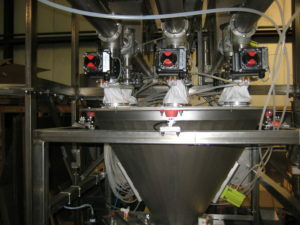 The photo to the left (Figure 6) shows a bulk bag unloading system with containment box and system.